Dyersville New Media instructs and supports clients who wish to build internet or low-power radio stations. We teach you how to construct and run your own system. We want our customers to never have to call us back. We help you learn because an educated broadcaster is a lucrative broadcaster! We also provide turnkey broadcast services for companies that do not have the staff or time to run a radio station. Dyersville New Media tailors custom radio streams for companies that want full control over their advertising. Let us build a station for your business. Our affiliate will build your company custom radio apps with your brand. You control the advertising, the music and programming. A custom radio stream is a powerful tool for growing and promoting your business. We are always here ready to help. Should there be a problem, we will help get you back on the air.We provide assistance with PRO accounting as well as music programming. We can help with Windows oriented broadcast issues. We also provide advice as to how one navigates through the broadcast radio world. It is very important to have empathy, help and support on the cutting edge of any service. That's what we do! We do all the work, your company gets all the attention !! We can help build your station and teach you to stay "on the air". Let us show you how to build and maintain your own Wordpress Site. Maintenance, support and instruction based set up assistance for Internet & Terrestrial Radio Stations. Radio Announcer, DJ, Internet and Terrestrial Broadcast Service Technician and Voice Talent since 1978. 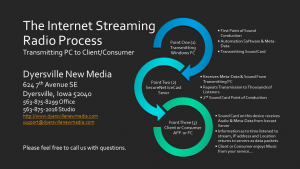 Ask about our Internet Streaming Turn Key and Low Power Terrestrial Radio Solutions. Your business or company will have it’s own tailored Android and Apple app for phones and tablets. Let us operate your Business Internet Radio service. We provide 24 hour control over your Business/Commercial Radio system. Let us add your content, commercials and music to your stream. We maintain, monitor and operate your station as well as add content upon request for a very low cost. Through our chosen provider, SecureNetSystems, we conduct all your music accounting with the PROs. (A.S.C.A.P. , B.M.I. , S.E.S.A.C. & SOUND-EXCHANGE). We are able to install low power AM Radio systems for Business, Colleges, Hospitals or Resorts. We also have a soft spot for those who enjoy radio broadcasting as a hobby. Our fees are inexpensive and simple. It will not cost too much to get your station operational. After all, this is the future of radio. Dyersville New Media Low Cost Voice Services Click Here! Click Here for our $99.00 Website Construction Special! Please never hesitate to ask questions!! The below image is a downloadable .pdf. Click on one of the banners below.